Lawks a lordy, my bottom’s on fire. 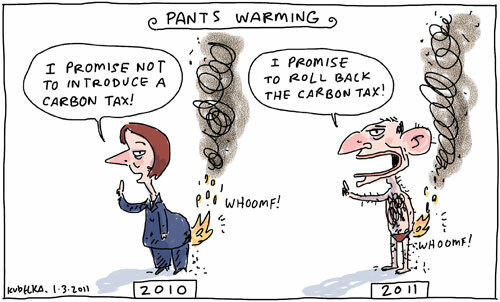 The best way to start reducing emissions would be to get a fire extinguisher onto those pants ASAP . Noice. Although in Julia’s defence if Australia had had the good sense to vote for a majority Labor government, and kept the pesky independents out of the parliament, she could have kept her promise. I blame you for making Wilkie look good. I made Wilkie look good? I reckon the major parties did that pretty well without any help from me. P.S this is also for a english school assignment.